By now you’ve heard the saying “Keep Austin Weird”. What you might not have known is who coined the phrase and how it just might actually relate to Austin, Texas. All those questions (and more) can now be (mostly) answered by the man himself, Red Wassenich, who did in fact come up with the saying as an offhand remark when he called in to a local radio station. 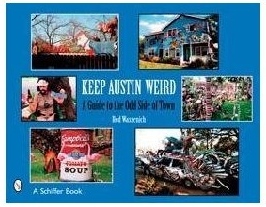 Now Red has a book chock full of Austin and Weirdness: Keep Austin Weird: A Guide to the Odd Side of Town, by Schiffer Publishing. 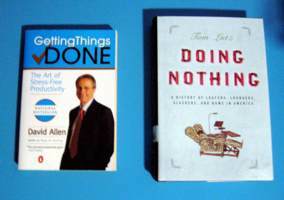 This entry was posted in austin, books, media, travel on April 30, 2007 by donturn. Do they cancel each other out? This entry was posted in books on December 23, 2006 by donturn. This looks like an interesting book from the Harvard Press: The Power to Predict. What I hope to find upon reading it is that a business can be more competitive by being more data driven than their competitors, be it from extending Knowledge Management ideas to fully forming a company around leveraging knowledge or from using data to help establish a conversation with customers about expectations and higher levels of service. This entry was posted in books, media on March 6, 2006 by donturn. Oddly enough, the ultimate CS classic – Donald Knuth’s The Art of Computer Programming, Volume 1 (or any of the other volumes) aren’t available via Amazon’s “Look inside this Book” feature. I thought it would be a quick way to look up just one thing when I don’t have the book at hand, but amazon.com has missed scanning and OCR-ing this one. Even more strangeness – a google search reveals a product search result (i.e. an ad) for the book at Wal-mart.com. Am I the only person who cares about this book any longer? This entry was posted in books, dev on July 25, 2005 by donturn. Shelby Foote, novelist, narrative historian, PBS personality (and perceived Foghorn Leghorn inspiration) died this monday, June 27, 2005. The New York Times has a fine obit, with at least one good quip by the author, which we are want to expect and enjoy. NPR also just re-ran an interview with him made in 1994. I can make the claim that I’m one of many who have read all 1.5 million words of his Civil War, a Narrative three volume set. Not only are they essential to getting an understanding of how the South and North (note the capitalization) are similar and different from each other even today, it’s also a great read into the management styles of the various military leaders as well as one of the best (threaded throughout the set) Lincoln biographies in context of this series of battles. I also enjoyed a series of letters between Foote and his friend Walker Percy (author of most famously The Moviegoer). I remember savoring an interview with Mr. Foote in September 2001 where we got to hear him talk about his work and life, as well as tour his home office and get a look at his favorite books. Memorably, he was a devotee of Proust and had read his Remembrance of Things Past many times, from the same set and each time and wrote the dates of his readings in the back of one volume. That is something we all might want to do with our favorites. Perhaps I’ll do that with my own editions of Mr. Foote’s works. Note: the phrase “Let us cross over the river, and rest under the shade of the trees” is said to be Civil War general Stonewall Jackson’s final words before dying in 1863, which some say was a major turning point in the Civil War. This entry was posted in books on June 30, 2005 by donturn. This entry was posted in academic, books, media, publications, research, web on April 22, 2005 by donturn. Of course, tomorrow is the beginning of the Texas Book Festival, if anything else – to prove that some of us here in Texas do in fact read. 2:00 – 3:00: What’s So Funny About Politics? Oscar-winner Peter Bogdanovich will introduce two of his favorite films: 7 p.m.: Targets & 9:45 p.m.: Saint Jack. This entry was posted in austin, books on October 29, 2004 by donturn. Learn, be amazed, and tell your friends. RealAudio format. This entry was posted in books, fun, media on July 12, 2004 by donturn.